Saudi Arabia sees oil revenues soaring by 80 percent over the next six years, according to unnamed sources that spoke to Bloomberg. The information is not public yet but plans are for the Kingdom to increase its output to a level that, combined with an assumption of higher oil prices, will allow Riyadh to book its first budget surplus since 2013. The plan, devised to get Saudi Arabia out of the budget deficit that the 2014 crisis plunged it into, envisages an increase of oil sales revenues to US$214 billion (801.4 billion riyals) in 2023, from US$117.32 billion (440 billion riyal) in 2017, provided crude oil rises to US$75 a barrel. 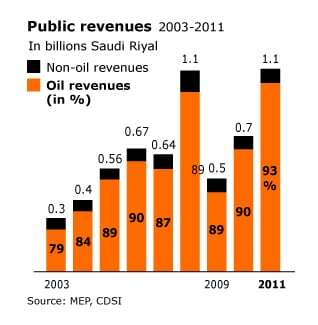 This plan sees non-oil revenues rising by a lot less: 32 percent, to US$90 billion (337 billion riyals). The news comes amid much-publicized plans by Riyadh to wean itself off crude and stimulate greater economic growth through diversification into non-oil industries, such as tourism. In order to be able to take full advantage of higher prices—if they materialize—Saudi Arabia plans to up crude oil production to 11.3 million bpd six years from now. This year, the daily average will stand at 10 million barrels, with the country bound by its participation in the OPEC-wide production cut and regularly going above and beyond its pledge to compensate for laggards such as Iraq. This plan suggests that despite some suggestions to the contrary, OPEC’s number-one producer has no intention of making the production cut permanent, which greatly increases the significance of the exit strategy that OPEC officials are already working on. The exit would have to be very gradual indeed, and will have to be combined with lower production elsewhere if prices of US$75 a barrel are to become a reality as per the Saudi six-year plan. 80% huh? Hmmmmm. Count me skeptical. Sure, the oil traders will do what they always try to do, namely manipulate the market price of oil. But getting it 80% higher than today? I dont think so. If anything, the more traders jack up the price the more fracking and other new technologies will be invented thus increasing supply. Saudi Arabia is in no position to take on america. They are liable to find themselves without a kingdom and wothout a country if they dont watch it. Clyde, 80% increase from $60/b is only $108/b in six years. I'll be surprised if that's all it is. In six years the global demand should be somewhere around 7 to 9 million bopd greater from where it is now. That supply won't materialize out of thin air. It will have to be incentivized to reach it. I think it'll be higher than $108/b in six years.